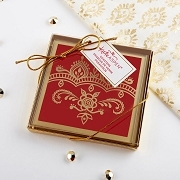 Make a big impression with your candy favors using our Personalized Round Gold Candy Tin from the Sweet Heart collection! 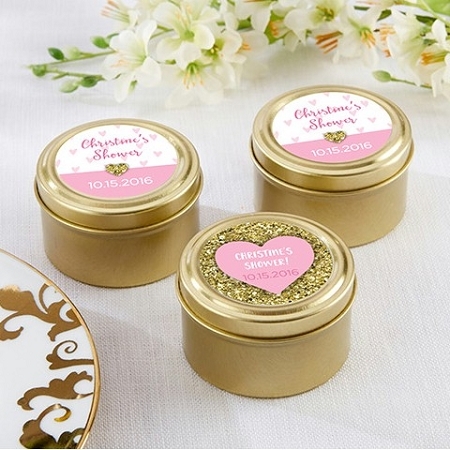 Add your choice of a personalized pink, white, and gold Sweet Heart sticker showing your name and event date to make these excellent additions to bridal showers, baby showers, weddings, Valentine's Day parties, or any occasion that makes you want to gift your guests with something special! After the event is over, the candy tins can be reused time and time again! The order processing time is stated on each product page and varies by products. 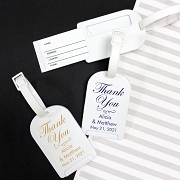 Generally non personalized items are shipped within 3 business days or faster. 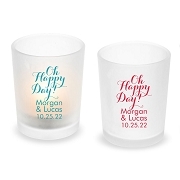 Personalized items are shipped out within 7 - 10 business days. Please note that expedited shipping will not speed up the processing time. We use real time shipping rates based on weight and destination. At checkout you can choose from: ground service, 3 day, 2nd day and overnight service. Report them within 1 week. For damaged items, please email us a picture this will be the fastest way of sending replacements. 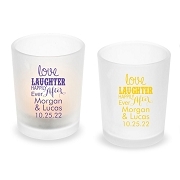 For personalized glassware we are only able to issue credit for damaged items. Please order some extras. We have a 30 day return policy on non personalized items. We are not able to accept partial returns. All Personalized and edible items are non returnable. Contact us for the return instruction. Return shipping charge to be paid by customer. Once we received your return it will take 2-3 business days to issue your credit on your card or PayPal account. Your refund will be less the original shipping cost.